Flying into Chicago over Lake Michigan the forecast temperatures were something like -16. Welcome to the US of A! The first-night hotel bar entertainment was provided by singer-pianist Ms Sammy Scott. Comes Love is where the Brit abroad came in. 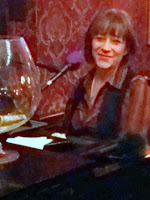 Scott sang in a knowing, world-weary style accompanying herself at a Yamaha baby grand with some sympathetic piano. A Little Sugar in My Bowl, They Can't Take That Away from Me, Don't Get Around Much Anymore, Scott knew her stuff as barflies chatted about the ball game on the tv and business types talked business. Your reviewer and one or two others listenened to the music. Gee Baby, Ain't I Good to You? (did Ms Scott ever meet Spoon, one wondered? ), Billy Joel's New York State of Mind a good choice, so too The Shadow of Your Smile. A MillerCoors' pint of Blue Moon (available in selected Tyneside hostelries), some casual conversation, this was a pleasant introduction to the Windy City. Sammy Scott said she'd be happy to take requests before taking a short break. Now then, there's an offer! Bebop Spoken Here said hello to Ms Scott. How about I Thought About You ventured your correspondent. I love that tune, replied Scott. Second set, true to her word, Scott sang I Thought About You. Thank you Ms Scott! A Foggy Day in London/Chicago Town, The Lady is a Tramp, A Nightingale Sang in Berkeley Square, yes, here in Chicago one was made to feel at home.